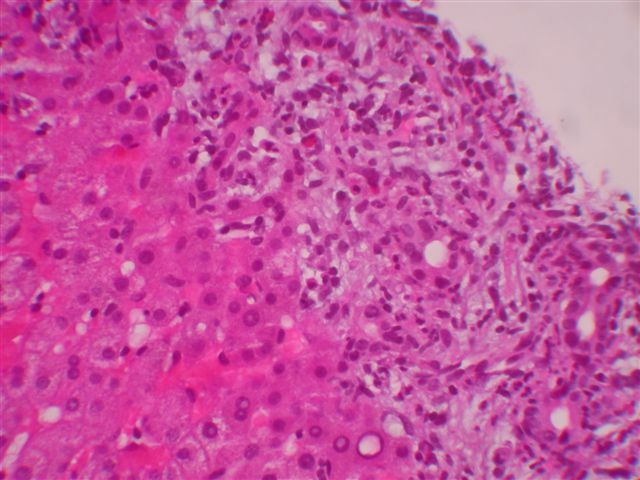 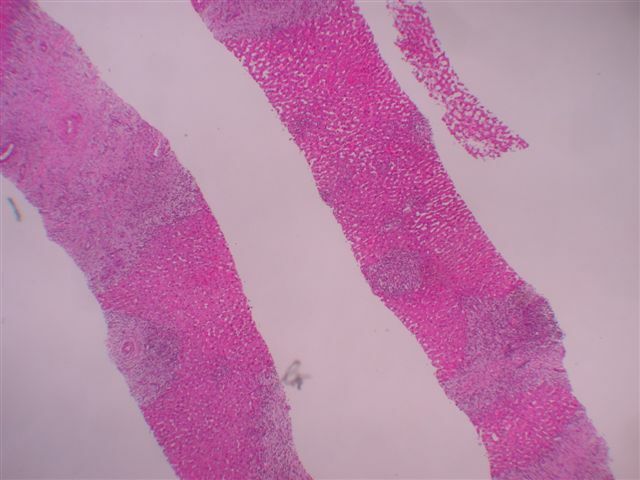 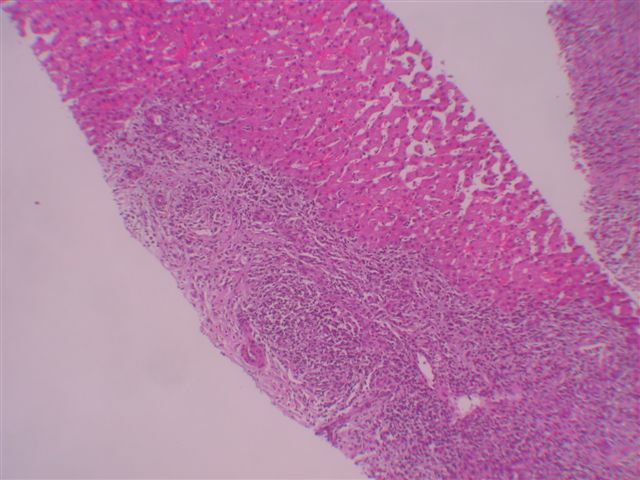 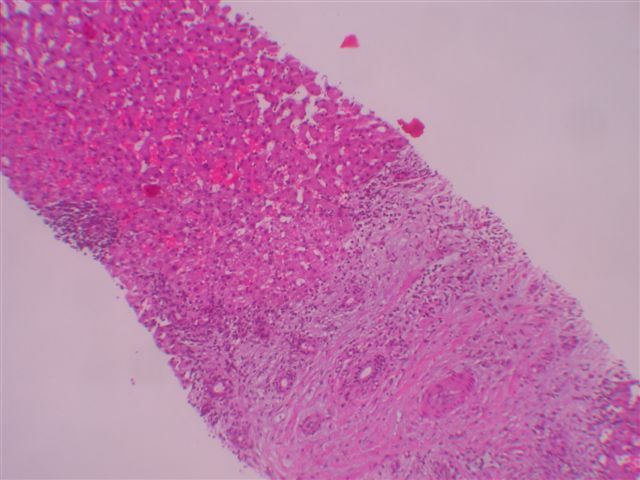 A trichrome stain confirmed the presence of fibrosis within the portal tracts.� An iron stain showed no evidence of increased iron stores. 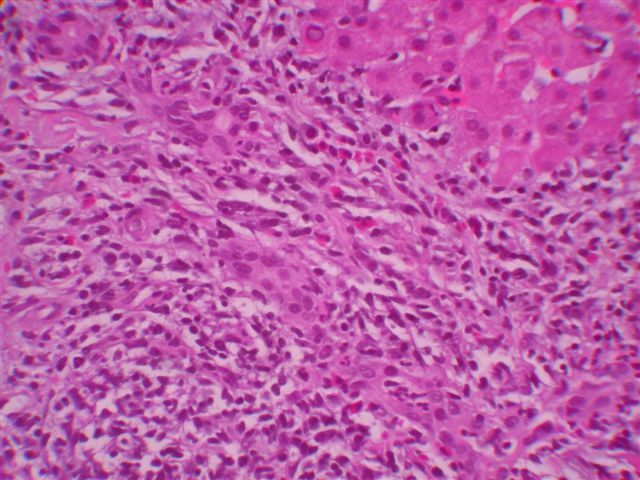 Inflammatory pseudotumor is also called inflammatory myofibroblastic tumor.� The diagnosis includes both reactive and neoplastic conditions.� Although common in the lung, it is rare in the liver.� The mean patient age is 37 years, but all ages are affected.� 75% of patients are male. 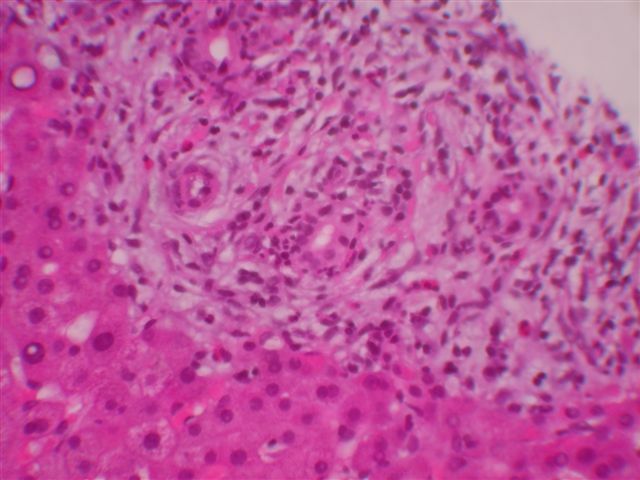 Presenting symptoms include fever and upper abdominal pain.� Tumors involving the hepatic hilum may cause portal hypertension and biliary obstruction, rarely requiring liver transplantation (Pediatr Transplant 2004;8:517).� Other associated conditions are occlusive phlebitis and chronic cholangitis (Hum Pathol 1994;25:86).� Uncommon associations are with Crohn�s disease (J Clin Gastroenterol 2004;38:818), and post-hematopoietic stem cell transplantation (Bone Marrow Transplant 2004;33:103).� Surgery is curative, although the tumors occasionally regress spontaneously. 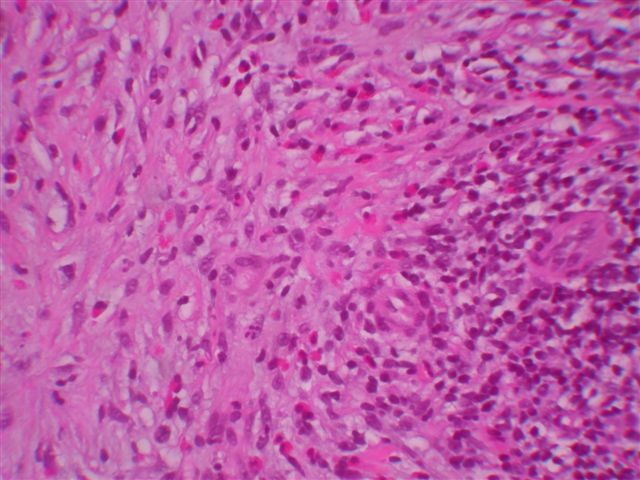 Microscopically, the tumors consist of a mixture of inflammatory cells, particularly polyclonal plasma cells, lymphocytes, eosinophils and macrophages.� Neutrophils may also be present.� There are also variable amounts of plump spindled cells resembling myofibroblasts and mature fibroblasts.� The stroma is often whorled, resembling leiomyoma or fibrotic resembling sclerosing hemangioma.� Mitotic activity is rare. 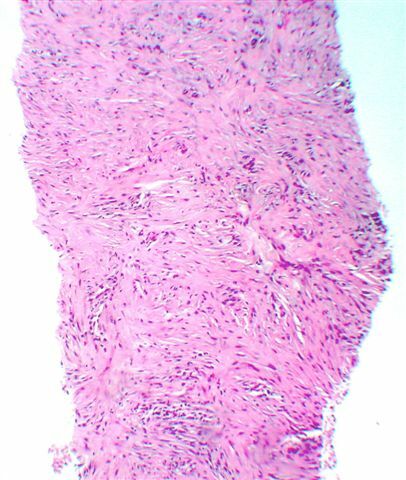 The differential diagnosis is large.� First, if the excision is subtotal, the diagnosis must be considered tentative, as other neoplasms may have a similar inflammatory component.� Second, dendritic cell tumors must be excluded.� They usually occur in women, often have systemic symptoms and are immunoreactive for follicular dendritic cell markers CD21 and CD35. 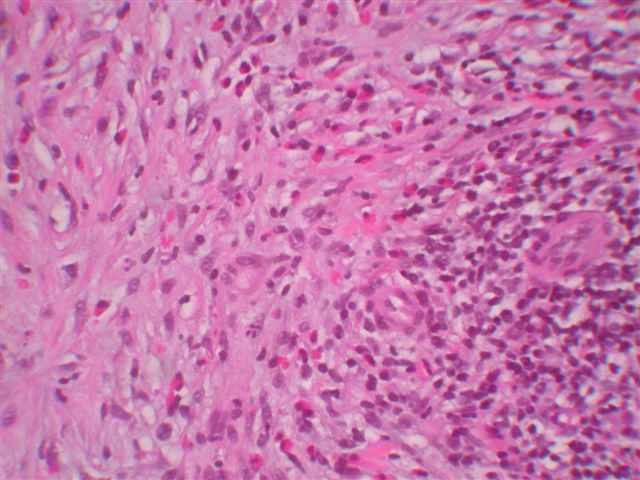 The inflammatory tumor-like variant is usually associated with Epstein-Barr virus infection (Am J Surg Pathol 2001;25:721).� Third, infectious disorders, such as TB, syphilis or bacterial abscess may cause an inflammatory infiltrate, and antibiotics or NSAIDS may cause tumor regression (Acta Gastroenterol Belg 2005;68:382, Scand J Gastroenterol 2005;40:875, J Clin Pathol 2003;56:868).� Fourth, inflammatory disorders such as sarcoidosis, malakoplakia, abscess and cholangiohepatitis should be considered.� Finally, tumors to consider include sclerosing hemangioma, leiomyoma, solitary fibrous tumor, sarcomatoid carcinoma, nerve sheath tumors, Hodgkin�s lymphoma and MFH.� Post-operative spindle cell nodule is similar morphologically, but has a different clinical history.